Points drawn on a surface by painters can be thought of as the simplest element in the figurative arts. Some believe, however, that points in pictorial art are difficult to define in geometrical terms. Hiroshi Suzuki, who heads the Constellations of the Earth project, specializes in research on techniques for producing pictorial art, and he is one among painters who believe that points in such art are a complex element that cannot be discussed without consideration of shape, area and material. In this project, Suzuki produces pictures on a large scale as a way to gain a deeper understanding of points in pictorial art. By doing so, he seeks to illustrate (through the large markings, the points, that emerge in the process of, or as a result of, this production) that points are a strong, complex expression of the artist’s will that is imbued with focus and tension. Kandinsky, who is known as the forefather of abstract painting, wrote in his Point and Line to Plane that points in art differ from those in mathematics in that they are “1. a complex (size and form) and 2. a sharply-defined unit” (Kandinsky, 1979. p.35). The observations on points in the said work are not limited to the field of painting, but rather cover a wide range from architecture to sculpture, from photography to music. Kandinsky remarks that in art, a point not only serves to determine positions, but also has the capacity to indicate vectors or zones. One way to go about learning more about points might be to analyze past paintings as if by magnifying them using a microscope. Suzuki, however, reasoned that producing large pictures, which would have to be seen from a distance, would enable analysis that would yield great insight into the characteristics of points. Suzuki’s Constellations of the Earth draws pictures on the ground using radars and corner reflectors, capturing a large area of land from a high altitude. The project was founded on his research on creating geoglyphs using satellites, which he carried out as the 2010 selectee for the “Project to Support the Nurturing of Media Arts Creators” run by the Agency for Cultural Affairs, and on his subsequent collaborative research with Masato Ohki from the Japan Aerospace Exploration Agency (JAXA), which they initiated together in 2013. The constellations in this project are “pointillistic” pictures formed by reflecting radio waves at points across the land. Few are afforded the opportunity to view Robert Smithson’s Spiral Jetty from the sky with their own eyes. Its scale and form are largely perceived through documentary footage or photography, or on the ground at the actual site. 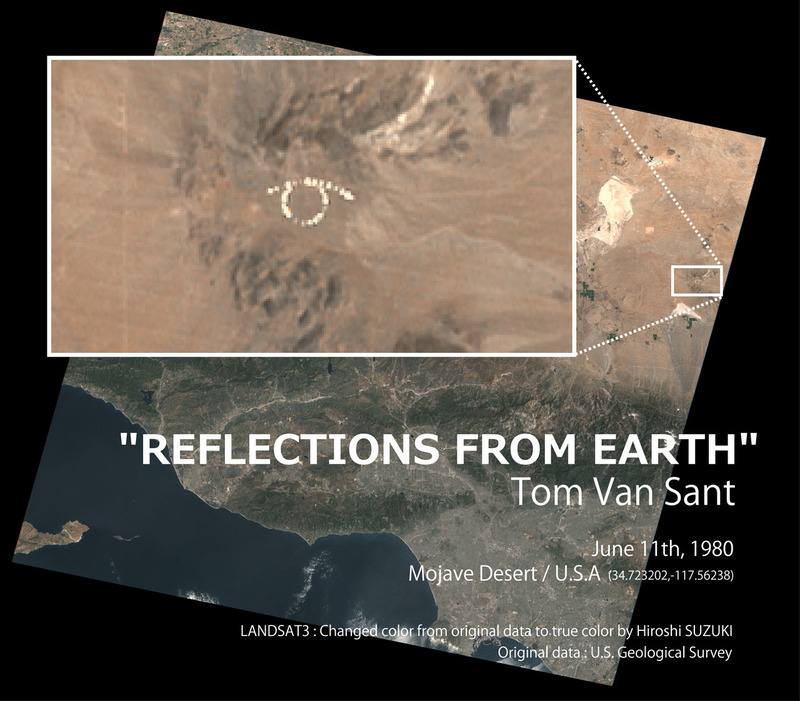 In 1980, Tom Van Sant produced Reflections from Earth, the first-ever geoglyph to utilize an artificial satellite, in the Mojave Desert outside Los Angeles, U.S.A. (Sakane, 2010. p.310). The picture, created by using mirrors to reflect sunlight, was recorded in the data collected by the Earth observation satellite LANDSAT-3. The recorded geoglyph (which depicted a human eye) has been archived – along with most data on Earth that mankind has hitherto gathered from outer space – as part of the data taken for the purpose of uniformly observing the Earth’s surface. 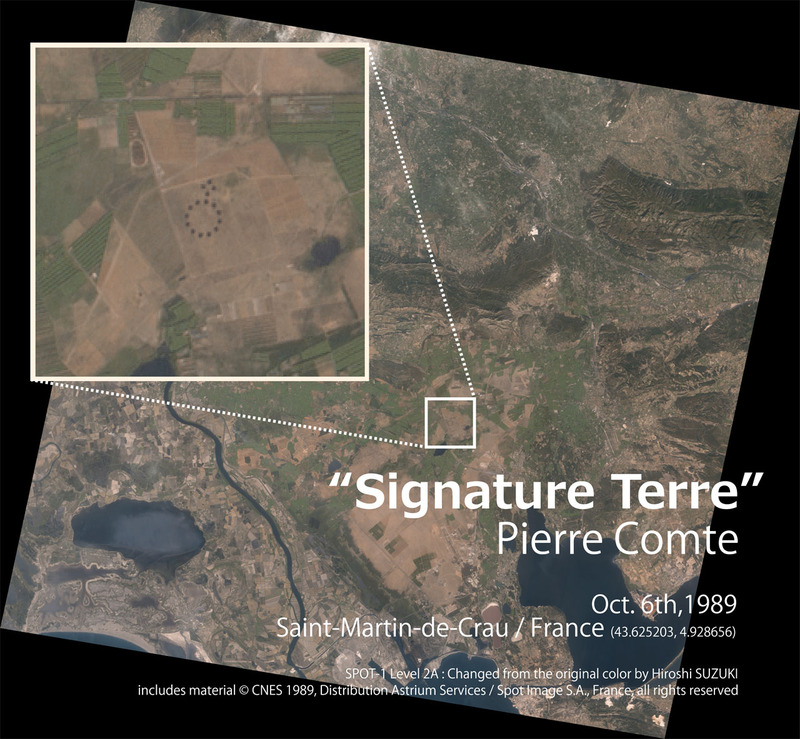 In 1989, Pierre Comte created Signature Terre, which was captured by the Earth observation satellite SPOT-1 (Suzuki, 2013. p.72). The satellite images that record these works are still available today on download, for a fee or gratis, from the organizations that administer the relevant data. It is likely that such data will continue to be preserved in a similar form, funded by national budgets. Earth observation systems using satellites already serve in today’s world as a recording medium for artistic creations. 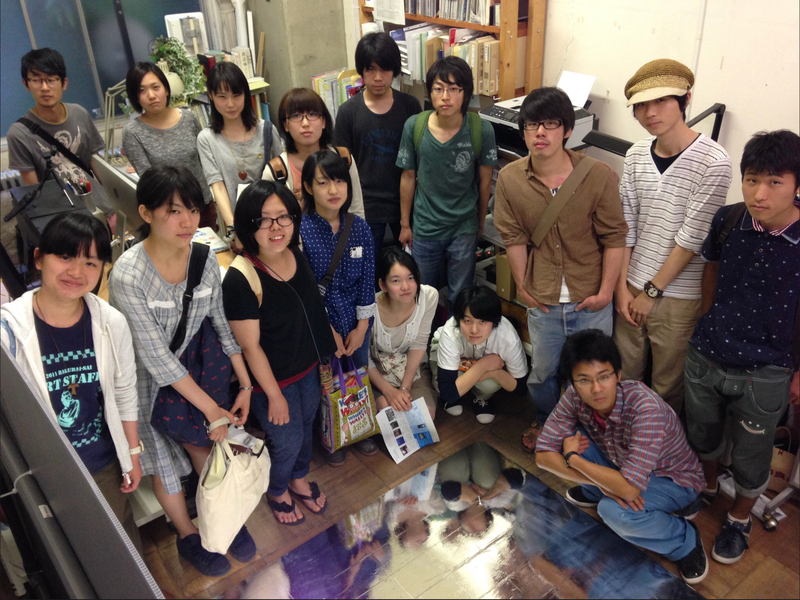 At the symposium held in connection with the exhibition Constellations of the Earth: The Tanegashima, Tsukuba and Moriya Constellations (August 2015; see p.104), Sakumi Hagiwara commented that “Constellations of the Earth is a work that seeks to find singularity within everyday life through fixed-point observation.” This project uses artificial satellites to secure a viewpoint for fixed-point observation. The countless points drawn in the works, the “stars,” show changes in everyday life that are revealed by fixed-point observation and difference analysis of satellite imagery. Here, let us address the relationship between the activities of Constellations of the Earth and fixed-point observation. Earth observation satellites carry out fixed-point observation by monitoring the Earth from (roughly) the same altitude and orbit path, periodically capturing images of the same areas. Users can then find various changes on Earth from this data. Through these artificial satellites, which are operated with constant precision by using technology that puts a wealth of science and theory into action, in today’s world we can secure a viewpoint for fixed-point observation that sees the Earth from outer space. In like manner, Daichi 2, one of Japan’s Earth observation satellites, provides us with a viewpoint from which to conduct fixed-point observation. The sensors installed on Daichi 2 observe the Earth by transmitting radio waves towards the ground, and receiving them again. As these waves can pass through clouds, the sensors have a high chance of being able to monitor the Earth regardless of weather conditions; as such, they are suited to fixed-point observation of topography or land cover. Constellations of the Earth uses satellite imagery gained through fixed-point observation by artificial satellites in order to create art. Looking for ways to convey that changes occurring in people’s everyday lives are in fact a sequence of singularities, of rare events, Suzuki arrived at the idea of using fixed-point observation from outer space. Suzuki and Ohki superimpose two satellite images taken at different times (but of the same area), and compose a third image by gleaning the places where change has occurred between the two images. This third image, which differs from the two images obtained through actual observation of the ground, no longer shows shapes that usually undergo little change, such as coastlines, ridgelines, rows of buildings, and transmission towers. Instead, substantial shapes that change in the course of everyday life – large ships floating in the ocean, trucks waiting at traffic lights, big trees felled in forests, newly built houses in town – emerge on the image as countless points. Imagining these points that appear on the third image as stars decking the land, Suzuki and his team finally bring the Constellations of the Earth to completion by marking new “first magnitude stars” on the ground, which are made by having the participants build and set up handmade corner reflectors. In this fashion, Constellations uses artificial satellites’ capacity for fixed-point observation, and visualizes the traces of the lives of the local residents, presenting them as myriad stars. Constellations is created by overlaying the constellation intentionally etched upon the land, onto the countless stars figured by the lives of the region’s residents. The “stars” depicted in Constellations of the Earth are mostly traces of the everyday. In addition to the “stars” born of natural phenomena, there is also a large proportion that became engraved in the satellite imagery as marks left by people’s lives (new houses, freight containers shipped into ports, quarried stone, felled logs). To put it differently, Constellation allows one to look back over people’s day-to-day environment that Daichi 2 has recorded and captured in its satellite images. What do such traces tell us? In Constellation’s images, the glimmer of the “stars” that appear are the changes in the angle of reflection (caused by changes in shape) and changes in scattering characteristics, in a particular place at different times. Viewers might be able to discover in them a sequence of different moments, in an everyday landscape that feels routine. If there is, among the changes found in Constellations, a special star that they themselves participated in drawing, then the gleam of that star might make them see everyday life for the precious and rare time that it is. Constellations shows that day-to-day living is a series of singular moments that will never be repeated. The philosopher Kiyoshi Miki explored the mechanism of imagination by examining the relationship between the feeling of apprehension that encourages people to act, and the shape that emerges as a result of that action (Miki, 1967). Human beings generate various shapes on the Earth in the process of deliberating and fretting over their actions. In Suzuki’s view, if shape is the mark of human thought that art and science reveal to the world, then the opportunity to capture this shape should not be wholly entrusted to machines and equipment that already serve that purpose. In today’s world, we make use of viewpoints that gaze on people’s lives from outside the Earth, and it is becoming easier to capture architectural artifacts or changes in topography and vegetation from high altitudes. Just as photography and the film camera began to play a role in artistic expression soon after the technologies were introduced to the world, artificial satellites too are beginning to assume a role in artistic expression. Earth observation systems, which capture changes all over the world through a broad perspective, will continue to discover and elucidate a wide assortment of shapes and differences, using electromagnetic waves of varied wavelengths. If the definition of photography requires light and a lens to be involved, then the products created by this project cannot be called works of photography. However, if we define photography more broadly, as “the process of giving electromagnetic waves (i.e. including radio waves as well as visible light) a lasting form as an image,” then satellite imagery captured with an L-band synthetic aperture radar might also constitute photography. The copyright for the original photographs from which Constellations is produced – namely the images captured by Daichi 2 – belongs to the Japan Aerospace Exploration Agency (JAXA). As of present (May 2017), release of these images from Daichi 2 is generally appended by “© JAXA.” The images observed are stored and administered in the JAXA database, and can be searched as products by specifying various conditions such as scene ID, time of imaging, and area. They are also sold by private companies, not just for research purposes, but for wide general use. The Constellations project has the Daichi 2 observe the corner reflectors created by the participants themselves. If successful, it means that satellite images containing the newly drawn “first magnitude stars” that comprise the constellation will be permanently archived in the JAXA database. Even if Constellations of the Earth is not a work of photography in the narrow sense, it mimics the format of conventional photographic works. Firstly, this very project archive is aimed to function as a photography book, and does not object to the images in its pages being perceived as the substance of the artwork Constellations of the Earth. The project also produces original prints using digital C-type printing. The original prints represent observed images of Earth from high altitudes above the Earth, and faint reflections of electromagnetic waves on the Earth’s surface, with dark black shades, allowing easy comparison with photographic works exhibited in the field of art. This demonstrates that Earth observation systems predicated on remote sensing are just as viable an apparatus for producing art as cameras used on the ground, and that Constellations establishes itself as a work of art by presenting viewers with the captured imagery along with its context. Usually when people create a picture, they first need to conceive an idea. Miki’s argument that imagination comes hand in hand with unease has already been mentioned above. Many of the participants of Constellations share certain apprehensions with the project members. The radio wave reflectors (corner reflectors) are assembled by building frames out of vinyl chloride pipes, stretching wire netting across them like on tennis rackets, then joining the frames so that the faces of the structure form right angles. Adjusting the tension of the wire netting, and keeping the attached planes at right angles, are steps that cause some concern for participants who know that these steps will affect the reflection of the radio wave. Moreover, setting up the completed corner reflectors in school grounds, parks and such is a tense process, as there is a need to set the reflectors facing the right direction. What is more, there is even a possibility that Daichi 2 might target an area different from the scheduled area due to an emergency, for example a natural disaster; one cannot be 100% certain of being captured by the satellite. Together with Suzuki, Ohki and others, the participants overcome these many worries to complete the Constellations of the Earth. For them, Constellations is a picture that they drew themselves; they see the completed artwork from a special perspective. Suzuki discussed the pigment laid on the canvas in paintings as “traces of the conception and their accumulation,” examining the similarities between looking at paintings and looking at various traces on walls or floors in our surroundings (Suzuki, 2000). The thesis posited that the will of the viewer to see the painting is key for a painting to become established as such, and discussed how a creator of a painting goes about conceiving and envisioning their own work before the viewer. Most of these traces that surround us are given no attention in everyday life. However, once we focus on seeing them, then the time thereafter is spent in reasoning how the traces came to be where they are. In the same thesis, Suzuki argued that the value of paintings lies mainly in the act of depicting, and that the work can be seen as a physical object evidencing that act. The work created by Constellations can also be said to be a fragment of this process of consideration (or a photograph thereof). There is no way to tell from the outlook of the work that Constellations involves people drawing a picture on the land. Given that artistic production using satellites is not currently widespread, the organizers of this project believe that it would be more effective to present Constellations’images to viewers (those other than the participants) in an exhibition that includes some text, photographs documenting the on-the-ground activities, perhaps accompanied by the reflectors and a model of the satellite. This project, which seeks to provide a new way of perceiving society that connects the Earth with each individual, presents at its exhibition physical “evidence” of the waves being reflected back at the satellites at the reflectors’ locations, in order to make viewers imagine the actual sites where the graphic of the geoglyph was formed. In the arts, points can be found in fine art as spots of paint on a canvas marked with the tip of a brush, or in music in the form of notes placed on the staff. If one views a magnified image of paint on a canvas, one can see the shape and area filled with color, as well as other “parts” like thickness and light reflection. Similarly, when a scale indicated by notes on a score is played on multiple instruments, one can hear varied tones that vibrate the air in different ways, exposing the “parts” contained in a note. Historically, it seems that a “point” in art was merely an expedient nomenclature for a localized occurrence: points in one painting form a foreboding night sky with blue swirls; in one film, a single gunshot dominates the entire narrative. Ascription of the term “point” to these localized occurrences in artworks has generally been based on human sensibility. Behind this attempt to verbalize them as “points” lies a complex and layered world full of subtle areas, shapes, air vibrations that transmit. The insight that can be gained by observing the particularity of the points – points that have been drawn as part of producing a large-scale geoglyph – prompts discoveries about what it is that occurs when a dot is painted on a canvas, or when a note is played. The stars of Constellations are imaged by satellites that receive waves thrown back by many reflectors set up across the land: in other words, they are an aggregate of many parts. The experience of sharing the 20 seconds or so of time while receiving the waves from the satellite is also an aggregate of tense moments spent trying to keep the angle of the reflector exact; it is a tangle of complex processes. Constellations also involves an experience of learning that the individual stars (or points) comprising the constellations are each filled with many parts and instances. Constellations of the Earth can allow human beings to shine as a single point on the Earth as it floats in the universe. The idea of creating a geoglyph gathers people to open spaces, and the functions of the artificial satellites record the time and location of these activities. Science that provides high-quality sequences that enables fixed-point observation, and art that attempts to crystallize precious moments in each location that can never be repeated – Constellations of the Earth is an amassment of the points that these two disciplines drew together in one field. ● Kandinsky, W. (1979). Point and Line to Plane, Dover Publications. ● Suzuki, H. (2013). “Uchu Geijutsu no Hensen – Jinko Eisei wo Chushin toshite” (Changes in Space Art: With a Focus on Artificial Satellites), Bulletin of Kanazawa College of Art, 57, Kanazawa College of Art. pp.69-77. ● Miki, K. (1967). Miki Kiyoshi Zenshu (The Complete Works of Kiyoshi Miki), 8, Iwanami Shoten. ● Suzuki, H. (2000). “Ato no Gainen to Bi” (The Concept and Beauty of Traces).